What’s next for New York’s environmental movement? It’s been just over a month since Governor Andrew Cuomo’s administration announced that fracking would be banned in New York State. This decisive victory for environmental activists who had campaigned for years to keep the industry out of the state also presents a dilemma: Without a high profile issue to rally around, will the state’s environmental movement be able to achieve more far-reaching goals? 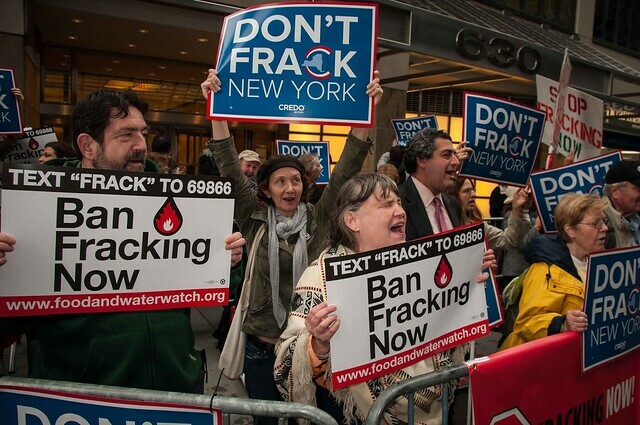 The ban on fracking is freeing up precious time and resources for the New York environmental community to move onto other campaigns, many of which are related to unconventional oil and gas development. In a post on its website Catskill Mountainkeeper, a grassroots organization involved in the anti-fracking movement from the very beginning, summed up the mood as follows: “This is a huge win for New Yorkers,” the organization wrote, “but the fight is far from over.” Indeed, some activists argue that Cuomo’s decision to ban fracking was less fraught for the governor than it seemed. With oil and gas prices as low as they are, the economic imperative to drill simply wasn’t there. In a few years oil could easily be trading at $100 a barrel, natural gas prices could be high, and a future administration might decide to change course. That includes New Yorkers. Carluccio in no way downplays the significance of the Cuomo administration’s decision — it has changed dynamics on the ground —but points out that threats from fracking, direct and indirect, remain. Long before the ban became official policy there were a number of projects underway in New York that are a direct result of the energy boom (According to Catskill Mountainkeeper there are more than 40 proposed or approved gas infrastructure projects in New York state alone.) There are efforts to turn the western part of the state, known for its wineries and lakes, into a gas transportation and storage hub. There are several proposed pipelines that would carry gas from the Marcellus Shale to markets throughout the Northeast. And there are trains carrying shale oil from North Dakota’s Bakken formation passing through towns and cities in New York on a daily basis. Much of that oil is being offloaded in Albany and then shipped by barge or rail to refineries along the East Coast and Canada. According to Harris, Rising Tide and a network of environmental groups in the Northeast are in the process of planning a major strategy meeting that will focus on the infrastructure fight or on oil-by-rail, both of which have become top priorities. “The invitation is not just to do broad based organizing strategy but also to employ direct action,” he says. Even as the fracking ban was announced, We are Seneca Lake, an environmental group opposed to the planned storage of liquid petroleum gas in the Finger Lakes region, had launched a civil disobedience campaign to draw attention to the project. To date more than 200 people have been arrested. Meanwhile, activists in Pennsylvania and New York have joined together to fight the Constitution Pipeline, which would cross most of New York’s southern tier. The Stop the Pipeline coalition is a sophisticated network of landowners and environmentalists working to protect their, “lawns, fields, forests, wetlands and streams.” Agencies like FERC and PHMSA — no longer simply arcane acronyms —are routinely engaged by residents, landowners, and activists who have inserted themselves into the regulatory process. Public hearings are packed and the agencies that approve pipelines or compressor stations are closely scrutinized. This would not have been the case five years ago before the anti-fracking movement emerged. Thus the fracking opposition has given birth to a new wave of environmentalism, broadly opposed to the extractive industry and highly conscious of the ways that oil and gas development affects us all. “There’s been a sea change in terms of public awareness about the dangers of fracking and the foolishness of continuing to develop fossil fuels as an energy source,” Carluccio says. It’s not only infrastructure that poses a problem. There are still ways in which fracking could have an impact on New York’s air and water quality, raising public health and safety concerns. The state has few regulations governing the disposal of by-products from oil and gas development, including radioactive drill cuttings. For several years a landfill in Chemung County has received solid waste from Pennsylvania’s Marcellus Shale, and the landfill would like to expand its operation. At least five other landfills in the state have done the same. A recent report from Environmental Advocates of New York revealed that the state had accepted at least 460,000 tons and 23,000 barrels of waste from drilling in Pennsylvania since 2010. (A large percentage of the wastewater generated from fracking in the Marcellus Shale is sent to Ohio and injected underground). In addition, there are few if any regulations governing the withdrawal of water from rivers and streams in New York state for use in fracking operations elsewhere. Perhaps the biggest challenge for environmental groups in New York State is figuring out how to reduce our dependence on fossil fuels. Carluccio says a lot of groups are now putting time and energy into coming up with solutions, but admits that more needs to be done. She points to Josh Fox’s solutions grassroots tour, a sort of traveling roadshow devoted to clean energy and the Delaware Riverkeeper’s own blueprint on renewables. Catskill Mountainkeeper has launched Renewable NY, a new campaign with the ambitious goal of transitioning completely to renewable energy by 2050; the organization recently received a $1.8 million grant to continue its work. Even though the task is daunting Carluccio says she’s hopeful because there are so many more people involved today than there were five years ago. Indeed, another kind of infrastructure has emerged in the wake of New York’s long battle against fracking — an engaged network of residents, activists, and environmental organizations. Catskill Citizens for Safe Energy, for example, was formed in 2008 when residents got wind of the oil and gas industry looking to drill in the area. From a handful of people gathering around a kitchen table the group has grown to more than 14,000 members in several states. As the name suggests, the organization has always been interested in more than simply banning unconventional oil and gas development in New York. Early on the group focused on issues like energy exports, infrastructure, and the end use of fossil fuels. Wiener says when she and her allies started out back in 2008 most of the big green groups told them the best they could hope for was better regulation of the industry. But Catskill Citizens and a handful of other grassroots organizations in the state weren’t having it. They saw what was happening in other parts of the country and sought an outright ban. “We really believed it was possible and it was,” she says. The question now is how to translate that win into another victory. Rising Tide’s Harris says his organization plans to escalate direct action tactics throughout the Northeast into the fall. At the same time frontline communities in New York and the region have been radicalized and educated about the threats of oil and gas development. And they’re showing no signs of slowing down.